Kizuna board members serve community member supporters at Kizuna’s volunteer and donor appreciation luncheon. 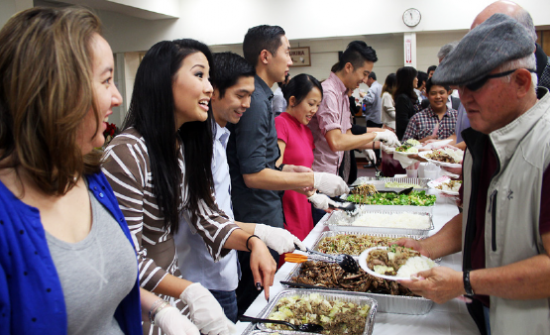 Kizuna celebrated its donors, volunteers, and supporters at an appreciation luncheon on Dec. 5 at Centenary United Methodist Church in Little Tokyo. In order to show the organization’s gratitude for all of the community support it has received over the past year, supporters were treated to lunch served by the Kizuna Board of Directors, as well as a recap of the year’s accomplishments. The exciting final piece of the event was a sneak peek at what’s to come over the next few years, as Kizuna gears up to celebrate its fifth anniversary in 2016. Community members had the chance to talk to Kizuna board and staff members, and have their hard work and generous donations recognized. Registration for Kizuna’s youth development camps and programs will begin in January, and more information about the organization and each program is available at kizuna-la.org.